In an op-ed in the Austin American-Statesman, former Texas Governor Mark White called for a new hearing for Edgar Tamayo, a Mexican national scheduled for execution on January 22. Foreign nationals charged with crimes in the U.S. are entitled to assistance from their consulate under the Vienna Convention on Consular Relations, but Tamayo was denied that right. White joins U.S. Secretary of State John Kerry and the Mexican Foreign Minister in calling for hearings to determine whether assistance from the Mexican government would have affected Tamayo's case. White highlighted the importance of upholding the Vienna Convention, saying, "If American states, including Texas, fail to honor Vienna Convention rights for citizens of other countries, then how can we expect those other countries to protect our own rights?" He concluded, "I hope that Governor Perry and Attorney General Abbott will do the right thing and protect Texas’ integrity at the same time, by allowing a court to hear Tamayo’s claims of prejudice." Read the op-ed below. As a former Texas governor and attorney general, I know that Texans are proud and honorable people. As President George W. Bush used to say, “In Texas, you’re only as good as your word.” Right now our state and country’s reputation is resting on the word of two elected officials who I hope will keep Texas’ integrity intact. I urge them to fulfill promises they and previous Texas officials made about the cases of several Mexican nationals on our death row. One of these is the case of Edgar Tamayo, a Mexican national with mental disabilities scheduled to be executed Jan. 22. Tamayo is one of ten Mexican nationals on Texas’ death row who, nearly a decade ago, were the subject of legal proceedings before the International Court of Justice — also known as the World Court. These cases caused international controversy because Texas authorities had violated their rights to have the Mexican Consulate notified of their detention under the Vienna Convention on Consular Relations, a treaty the United States became party to more than 40 years ago. This is the same treaty that ordinary Americans — and thousands of Texans — rely on for protection when they find themselves in trouble overseas. It’s the treaty that allows all Americans who are detained while traveling, working or studying abroad to contact the U.S. Consulate to help defend their rights. If American states, including Texas, fail to honor Vienna Convention rights for citizens of other countries, then how can we expect those other countries to protect our own rights? So it’s vital that Texas fulfill its promises regarding Tamayo. No one disagrees that Texas violated the Vienna Convention in the Tamayo case, and others. And under treaties that the United States agreed to many years earlier, the International Court of Justice has the power to determine the consequences of these violations. Ultimately, the court ruled that these Mexican nationals have a right to a hearing to show how consular assistance would have made a difference in their cases. In an earlier case, Bush agreed and directed Texas to provide the necessary hearings — but in 2008, the U.S. Supreme Court said that the president couldn’t force the state to provide them. Here’s where Governor Rick Perry and Attorney General Greg Abbott decided to do the right thing. In 2008, they wrote to the U.S. Supreme Court, Bush administration Secretary of State Condoleezza Rice and Attorney General Michael Mukasey regarding this earlier case, promising that Texas would ask the courts to review the Vienna Convention claims of Mexican nationals whose cases were the subject of the International Court of Justice’s decision. Abbott said that his office would “join the defense in asking the reviewing court to address the claim” if the courts had not yet done so. But, as of today, no court has ever reviewed the violation of Tamayo’s consular rights to see whether the Mexican government’s assistance would have made a difference. As it stands now, Tamayo will become the first person executed without any review of his Vienna Convention claim. I personally support capital punishment. But this case is not about whether we support or oppose the death penalty. It’s about fairness and having the courts hear all the key facts. In Tamayo’s case, a court review could have made a real difference. The defense requested psychological testing for him, but a state court denied funding for them. The Mexican Embassy, when it was finally informed of Tamayo’s detention, paid for testing, but it was too late. Even though the testing revealed that Tamayo suffers from significant psychological disorders, resulting from a previous head injury and an IQ of 67, no court ever heard this evidence. It is precisely the kind of “mitigating evidence” that might have prevented Tamayo from being sentenced to death. Perry could direct the Board of Pardons and Paroles to investigate the claim, but he hasn’t yet done so. Why is Texas opposing review of this evidence to determine whether it prejudiced Tamayo’s case, especially in light of its previous promises to at least not oppose requests for review, and perhaps even to join the defense’s request for review? We Texans are as good as our word. The governor and the attorney general — and Texas itself — have everything to gain by keeping their promise. Not to honor the Vienna Convention in the Tamayo — or any other — case, is to endanger the security of American soldiers, missionaries, foreign exchange students, Peace Corps volunteers and tourists abroad. I hope that Governor Perry and Attorney General Abbott will do the right thing and protect Texas’ integrity at the same time, by allowing a court to hear Tamayo’s claims of prejudice. 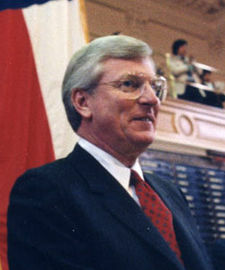 White served as governor of Texas from 1983 to 1987 and as attorney general of Texas from 1979 to 1983. He co-chairs the Constitution Project’s Death Penalty Committee, which promotes fairer administration of capital punishment. He can be reached at [email protected]. (M. White, "Perry, Abbott should be true to their word in handling Tamayo case," Austin American-Statesman, January 14, 2014.) See Foreign Nationals and New Voices.